The champion of the charts partners up with the champions’ watchmaker to officially become an ambassador for the Hublot watchmaking brand. 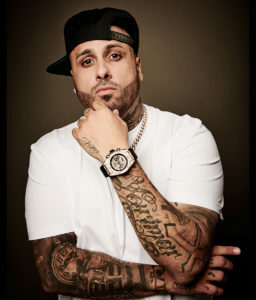 A long-term friend of the House of Hublot—in particular, we saw him last year during the festivities organized by the watchmaking brand at the Hublot Loves Art in Miami event—Nicky Jam is now becoming its ambassador. Nicky Jam is also part of the Hublot Loves Football movement, since he is none other than the writer of “Live it Up”, the official song of the 2018 FIFA World Cup RussiaTM. A song that he performs in the company of American star Will Smith and Kosovar singer Era Istrefi. By supporting Nicky Jam’s talent, Hublot is, once again, acting as a trendsetter. Nicky Jam thus becomes the brand’s first ambassador representing the Latin-American music industry. Hublot Loves Music!